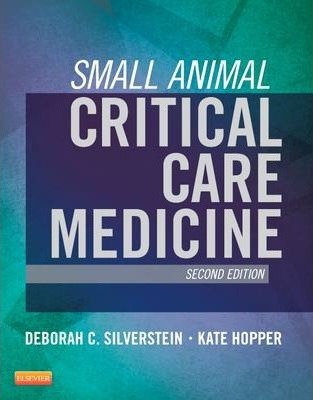 Small Animal Critical Care Medicine is a comprehensive, concise guide to critical care, encompassing not only triage and stabilization, but also the entire course of care during the acute medical crisis and high-risk period. This clinically oriented manual assists practitioners in providing the highest standard of care for ICU patients. "The second edition of Small Animal Critical Care Medicine should be somewhere in everyone's clinic, whether a first-line practice or a specialized clinic." Over 200 concise chapters are thoroughly updated to cover all of the clinical areas needed for evaluating, diagnosing, managing, and monitoring a critical veterinary patient. More than 150 recognized experts offer in-depth, authoritative guidance on emergency and critical care clinical situations from a variety of perspectives. A problem-based approach focuses on clinically relevant details. Practical, user-friendly format makes reference quick and easy with summary tables, boxes highlighting key points, illustrations, and algorithmic approaches to diagnosis and management. Hundreds of full-color illustrations depict various emergency procedures such as chest tube placement. Appendices offer quick access to the most often needed calculations, conversion tables, continuous rate infusion determinations, reference ranges, and more. All-NEW chapters include Minimally Invasive Diagnostics and Therapy, T-FAST and A-FAST, Systemic Inflammatory Response Syndrome (SIRS), Multiple Organ Dysfunction Syndrome (MODS), Sepsis, Physical Therapy Techniques, ICU Design and Management, and Communication Skills and Grief Counseling. NEW! Coverage of basic and advanced mechanical ventilation helps you in deliver high-quality care to patients with respiratory failure. NEW! Coverage of increasingly prevalent problems seen in the Intensive Care Unit includes multidrug-resistant bacterial infections and coagulation disorders. NEW chapters on fluid therapy and transfusion therapy provide information on how to prevent complications and maximize resources. UPDATED coagulation section includes chapters on hypercoagulability, platelet function and testing, anticoagulant therapy, and hemostatic drugs. Surgical And Postoperative Conditions 131. Perioperative Evaluation of the Critically Ill Patient 132. Portosystemic Shunt Management 133. Peritoneal Drainage Techniques 134. Post-Thoracotomy Management 135. Kidney Transplantation 136. Minimally Invasive Procedures NEW! ICU Design and Management 209. ICU Design and Management NEW! 210. Management of the Intensive Care Unit 211. Communication Skills and Grief Counseling NEW! "The second edition of Small Animal Critical Care Medicine should be somewhere in everyone's clinic, whether a first-line practice or a specialized clinic. First-line practitioners will find that this book allows them to understand the needs of those inevitable emergencies. At the same time this book will also offer a better insight in the extra care that a more specialized centre could provide for, helping first-line practitioners to inform owners and refer their patients. And finally, for those working in larger emergency facilities, this manual offers one of the best available resources to provide optimal care for your most challenging cases."